The rumors of our death? Exaggerations, all. January 19, 2015 January 19, 2015 • by • In News • Comments Off on The rumors of our death? Exaggerations, all. 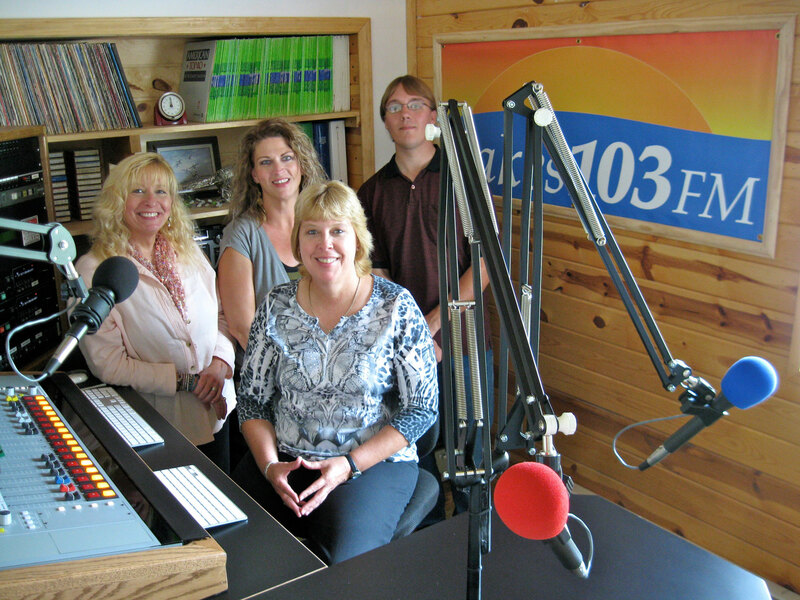 It’s been three long months since we last released new information about Lakes 103, Mora’s soon-to-be new FM station. This lack of info has surely led to some doubt about whether said station will ever be on the air. For those who’ve been wondering, the answer is YES! Not only will it be running in the near future, but – unknown to most – it already has been running, albeit briefly. The tower? Yup, it’s up. October 14, 2014 October 14, 2014 • by • In News • Comments Off on The tower? Yup, it’s up. 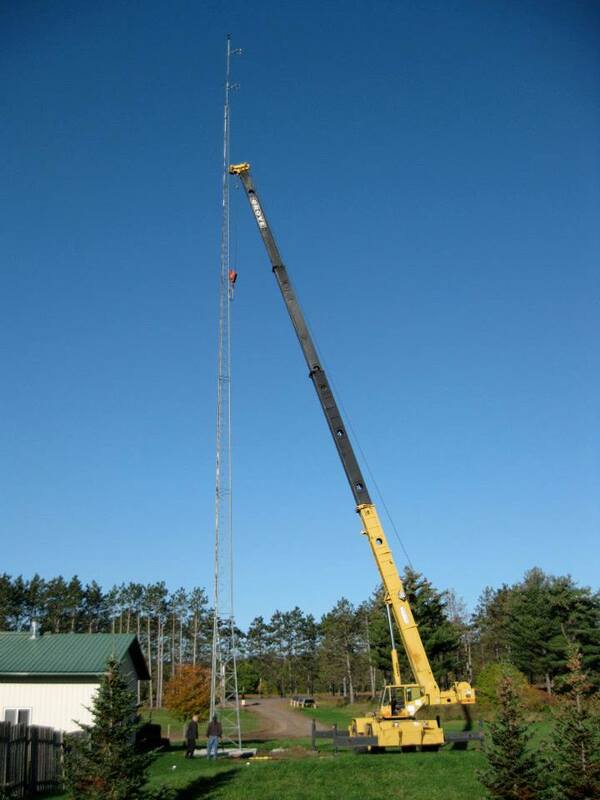 The Lakes Media Foundation is happy to announce that the tower for its upcoming FM station is now standing, moving Lakes 103 ever closer to its inaugural broadcast. You may recall that the tower started life several decades ago in Cambridge, where it stood downtown, next to the public library. An agreement between the Foundation and Isanti County allowed the Foundation to dismantle the tower and remove it from its former home this past June. 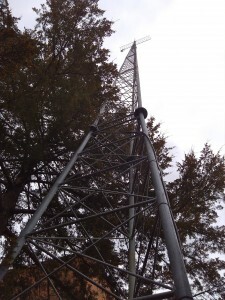 Throughout the following weeks, volunteers worked to refurbish the tower and prepare it for broadcast use. The project was largely undertaken by two longtime Foundation volunteers/donors. Adapting the tower for its new purpose ended up taking more time and effort than anticipated – but even so, the final result has far exceeded expectations. For the first time ever, the Lakes Media Foundation is proud to publicly announce details on its upcoming FM station’s programming. Until today, non-technical information on this new station has been sparse. This was by design; the idea being that the station’s launch would build anticipation and eventually lead to a pleasant surprise for local radio listeners. As the first week of August comes to a close, we here at the Lakes Media Foundation decided to take a look back at all we’ve accomplished this summer. 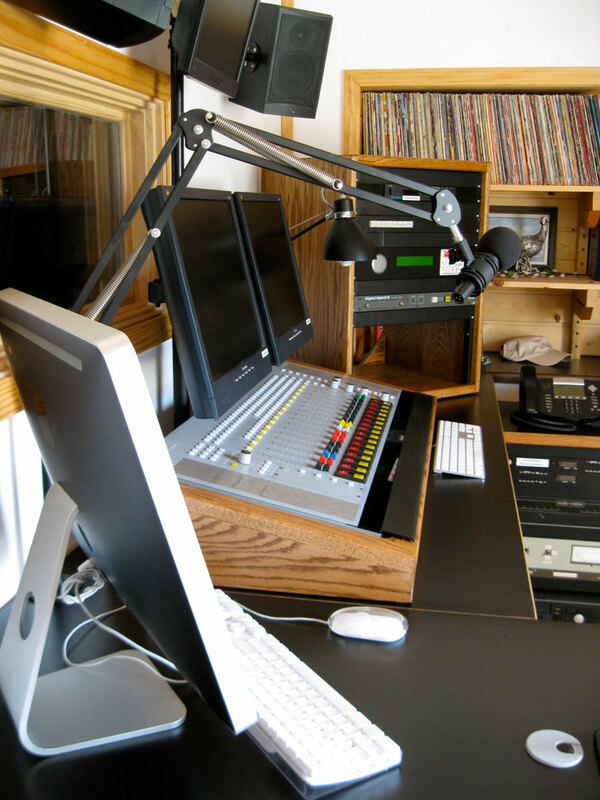 The Lakes Media Foundation is proud to announce that the studios for its upcoming FM station are nearing completion. Thanks to the work of an anonymous donor, brand-new studio furniture was built to our engineer’s specifications, which were designed to accommodate our equipment and fit properly into the space provided. All the labor and material was supplied to the Foundation free of charge. On Wednesday, June 4, Lakes Media Foundation director Keith Thelen appeared once again before the Isanti County Board of Commissioners, bringing with him a written agreement as previously requested by the Board. Karen Amundson, executive director of the Mora Area Chamber of Commerce, also attended the meeting in a show of support for the project. On Wednesday, May 21, Lakes Media Foundation director Keith Thelen presented a proposal to the Isanti County Board of Commissioners, which detailed the Foundation’s plans and desire to dismantle and subsequently acquire an abandoned communications tower belonging to the County. The tower, which is located at 244 South Birch Street in Cambridge, was erected between 40 and 50 years ago, and has been dormant for at least the past 25 years. The lack of a fence or other anti-climbing measures makes the tower a potential hazard and an ongoing liability issue at its current location, and deferred maintenance has only served to further amplify safety concerns. Without some sort of corrective action, it would appear that harm to persons and/or property involving this tower would be inevitable. The Lakes Media Foundation is happy to announce details of support which will be provided to the Foundation by Kanabec Systems. The Mora area tech firm has been instrumental in the Foundation’s work since its inception, and has recently expanded its support through donations of equipment, funding, and labor to help complete the construction of our upcoming FM station. 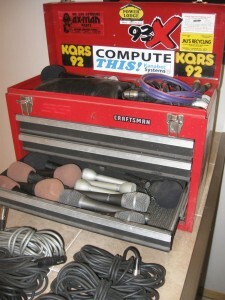 Since this project’s beginnings in 2006, Kanabec Systems owner (and Foundation founder/director) Keith Thelen has been collecting, saving, and storing gently used broadcast equipment whenever his clients and colleagues have had surplus gear to dispose of. Over time, this stockpile has come to include most of the components necessary to complete our on-air studios. 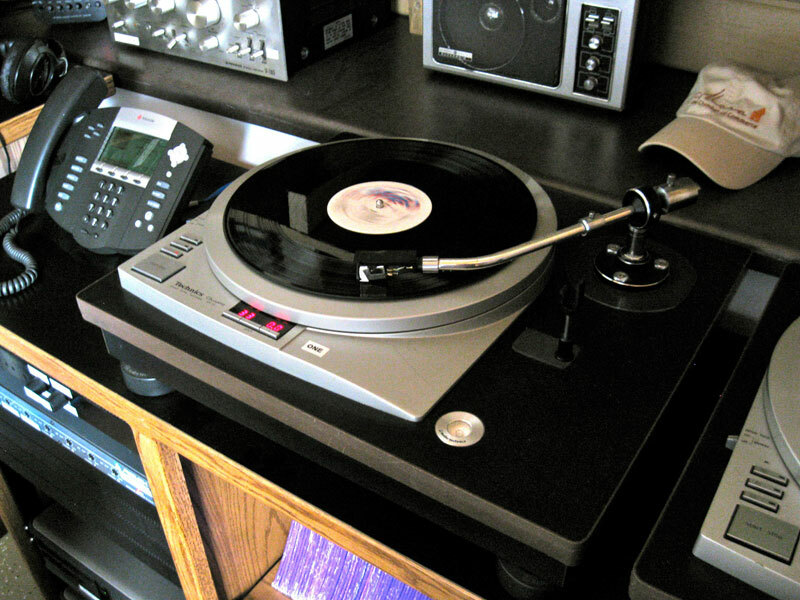 From microphones to recorders, and even a digital audio console, it’s all ready and waiting – made available to the Foundation free of charge. The Lakes Media Foundation is proud to announce that its new website is now up and running. Additions and adjustments will continue to occur in the coming days, but the basic structure is expected to remain largely unchanged. Since you’re already here, what more is there to say? Take a look around – we hope you enjoy your visit! Meanwhile, our web design folks have moved on to creating a new website for our upcoming FM station, which will be launched simultaneously with the station itself. Until that time, visitors to kciz.org will be redirected to lakesmediafoundation.org (this site). Keith Thelen, owner of Kanabec Systems, announced Friday his intent to open and operate a not-for-profit radio station: KCIZ-FM 103.5, covering the Mora, Ogilvie, and Braham area, as well as possible fringe coverage to Pine City and Cambridge.